The only female Chinese Imperial ruler was Empress Wu Zetian of the early Tang dynasty. Only two other women nearly reached such a high an Imperial position - Empress Lu of the Han dynasty and Dowager Empress Cixi of the last Qing dynasty. To this day in China, women rarely achieve positions of high office. The Standing Committee of the Politburo has only one woman (currently Sun Chunlan ➚ (2018)). Representation of women in top posts remains at under 5%. This makes Wu Zetian’s achievement that much more significant. A comparison with Queen Elizabeth I of England (1533-1603) is perhaps a useful parallel. Her rise to power was meteoric and during her reign saw China prosperous and relatively peaceful. And yet her legacy continues to divide historians. Witold Rodzinski wrote in 1984 ‘Wu Zhao, indisputably highly gifted, proved to be one of the most ruthless, unscrupulous and tyrannical rulers in the long history of the Middle Kingdom’. On the fall of the Empress her critics who had suffered under her rule ensured that she was unfairly vilified in the official historical record as a dangerous precedent - a female ruler. What is particularly amazing is that Tang dynasty record keeping gives us precise details despite the fact that the events occurred 1,300 years ago. In Europe records are often limited to who was the ruler but not who were his advisers and what they did on particular days. In the UK at this time the only reliable historical record was the Anglo-Saxon Chronicle ➚ where the events of a whole year were summarized in a single sentence. The attractive young Wu Zhao came to court as a fifth grade concubine of Emperor Taizong in 638 aged 14. She rapidly rose through the ranks to become his mistress rather than a mere serving girl. 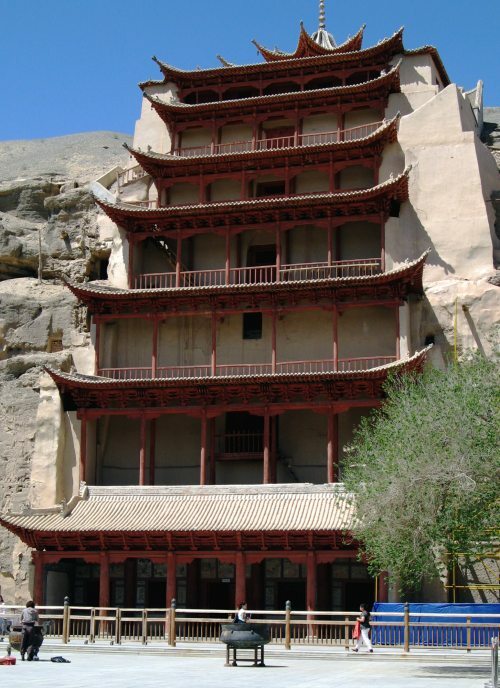 Disaster struck in 649 when she was 25 years old when the Emperor Taizong died. It was traditional for the Emperor’s surviving concubines to spend the remainder of their lives in a Buddhist nunnery. Either by guile or luck Wu Zhao escaped this fate by becoming romantically attached to the new Emperor Gaozong, Taizong’s son. Further advancement must have seemed impossible as Taizong was already married to the Empress Wang 王玉燕. In bitter palace rivalry with the Empress she managed to persuade Emperor Gaozong that the Empress was guilty of witchcraft and she was deposed. Wu quickly had former Empress Wang ➚ and Consort Xiao ➚ imprisoned and according to legend had their feet and hands cut off - but this is likely to be a myth to besmirch her reputation later on. A couple of stories from her reign cast a little light on her character. In 692 she had a cat trained so that it would be content to live in a cage with parrots without attacking them - by keeping it over-fed. When the cage was brought before the court to show off this marvel of harmony in nature, things did not go to plan. Perhaps upset by all the prying eyes, the cat reverted to type and killed one of the birds to the great amusement of the court. On another occasion she commanded all the peonies to flower out of season, when they did not obey she had them dug up and burnt. Although there may have been a vindictive streak she was clearly intelligent and shrewd. It would seem that as her rise to power was not purely based on selfish ambition, her opinion was genuinely valued by her husband Emperor Taizong. 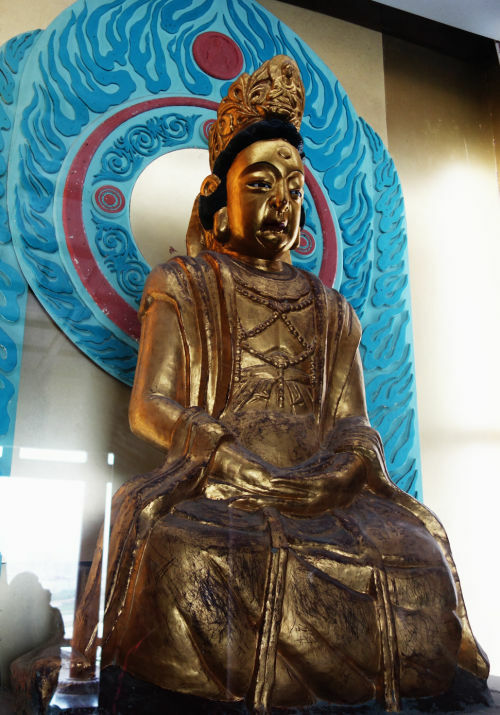 As Empress she became the Emperor Gaozong’s trusted adviser and so a person of great power in her own right. When the Emperor became ill with what is believed to have been a stroke in 660 the Empress became more influential and entered forty years of effective rule of China. It is true that she treated her opponents harshly, often having them killed, but that was pretty much normal for this time. Perhaps it might help explain by saying that all this predates the attitudes of the ‘Game of Thrones ➚’ era by 500 years (this TV series is broadly based on some actual historical incidents of the English War of the Roses ➚ 1455-85). She centralized power, taking direct control over regional fiefs and direct rule continued for the centuries to follow. The Sui dynasty had faltered after unsuccessful and ruinously expensive campaigns to subjugate the Korean peninsula. In his declining years Emperor Taizong launched another attack (655) exploiting internal divisions between the three Korean kingdoms. Although the campaign was successful - culminating in the burning down of Pyongyang in 668 - the campaign brought little benefit to China. Empress Wu (Wu Zetian) Image taken from An 18th century album of portraits of 86 emperors of China, with Chinese historical notes. Originally published/produced in China, 18th century. (British Library, Shelfmark Or. 2231) available under a Creative Commons license ➚. 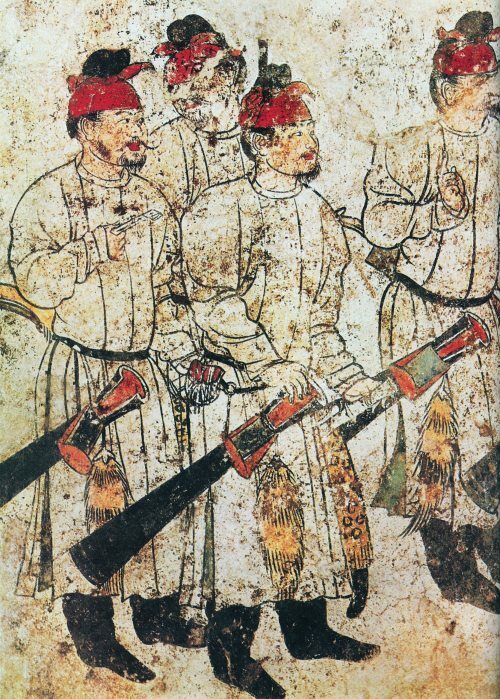 Military campaigns were also needed to keep the Mongols and to check a growing Tibetan threat. In general the expenditure on the military was not so onerous as it had been under the Sui dynasty and for most Chinese people this was a very welcome period of peace. The government had grown to become a very sophisticated system; there were already 13,500 officials to govern a population of about 50 million. Supreme power is briefly held by an Empress, once the Emperor dies the power moves to his successor and the family of the new Empress gain influence. However an Empress can continue to hold some power as the Dowager Empress. Empress Wu Zetian made her own children heirs presumptive rather than the former Empress Wang’s children. What she could not tolerate was obsequious sycophants - they suffered a grizzly fate. Time and again there are occasions when respected scholars gave wise advice that she followed even if it directly opposed her current policy. When Emperor Gaozong died on 27th December 683 aged 55 after a long period of declining health Wu Zetian was 58 years old - a good age for the time. When she took effective control in 684 over ineffectual sons, she immediately moved the Imperial court from Chang’an (Xi’an) to Luoyang (200 miles to the East). Although there was a revolt against her from Li Jingye 李敬業 ➚, it gained little support and suffered from poor strategic decisions. The revolt was put down in three months and her opponents killed. She instituted a brutal secret police force to deal with any future opposition; even talk of revolt could lead to decapitation. After a while reports of the unfettered brutality of this force caused Wu Zetian to shut it down. During this period she came under the spell of Xue Huaiyi 懷義 ➚ who had been a pedlar of medicines. He became the Empress’s lover and therefore immensely powerful and rich. He oversaw the building of the Imperial meeting hall Ming Tang 明堂 ➚ which was a vast construction - 294 feet high and adorned with an iron phoenix coated in gold on its top. Nearby a huge wooden Buddha 200 feet high was built - the Empress was a prime mover in promulgating the ‘new’ Buddhist faith in China. It seems the Empress soon became bored with an increasingly jealous Huaiyi. In a fit of pique he burned down the Ming Ting and also accidentally brought down the giant Buddha. She understandably had had enough of Huaiyi and had him strangled by some of her sturdier palace women. Some of this story (greatly embellished) inspired the epic film ‘Doctor Dee: Mystery of the phantom flame’ ➚. It was at this time that a ‘loyal’ petition for her to formally become Emperor was created that gathered 60,000 signatures. She initially politely rejected the request, as is the protocol, but was formally proclaimed Emperor on 21st September 690 as the first of the second Zhou dynasty ➚. By 695 Wu Zetian had become firmly established as Emperor but she was aged 70 and the issue of succession was growing in urgency. From the Imperial records it seems she did not plot to bring forward her own relatives as successors. 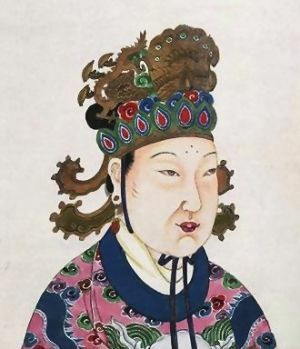 She had two sons by Emperor Gaozong after all, it seems she wanted to get on with ruling the vast and rich country, but this did not prevent factions within the rival Wu and Li families positioning themselves as potential heirs. Attacks by the Qitan and Tibetan neighbors made people wonder about her ability to rule and some local opposition briefly crystallized. However she seemed to have ruled wisely. She continued to take account of the the views of the powerful Imperial censors who were entitled to give their assessments on any topic and to highlight corruption and wrongdoing. She was known to be stern and fair, not swayed by flattery and raised people of talent to positions of power and influence. Aware of her anomalous position as a female Emperor she took to wearing a false beard at audiences. However she did take steps to further the position of women. Women were admitted to the civil service examinations and so some became government officials, but this pioneering development lasted only as long as she reigned. The Tang dynasty records, full as they are of the personalities at court do not tell the tale of ordinary Chinese people. The fact that the revolt against Empress Wuzetian usurpation of the Imperial throne did not gain popular support suggests all was going well for them. People had been enjoying a period of peace and prosperity after the turmoil of the Sui dynasty. There was no appetite to return to the long years of suffering under the ‘Period of Disunity’ [220 - 589] and then the Civil War that followed between Emperor Taizong and his father Emperor Gaozu in 626. In 697 at the venerable age of 72 the Empress took to two court entertainments called Zhang who were half brothers. They indulged the Empress in any and all of her fancies and soon became inseparable. They were showered in riches and their control of access to the Empress meant that any threat to their power could be easily dealt with by a word in her ear. It would seem that in her declining years the Empress decided to relax and have fun. She employed wise advisers to rule the country in her ‘retirement’ even those who had previously opposed her (including Di Renjie ➚). However the situation allowed her critics to plot against her. Wu’s own family had some reason to expect the succession should fall to them, but the claims of Taizong’s Li family were more valid. In 699 to help prevent potential civil war she gathered together her Wu family and made them swear to work in harmony with the Lis - hardly an action of a brutal woman. Eventually the Zhang brothers foresaw their likely fate after Wu Zetian’s death and bungled an attempt to bring the Wu family onto their side. The chief adviser then moved against the Zhangs but only when he had the blessing and presence of the former Emperor Zhongzong to give some semblance of official blessing. The Zhangs were put to the sword and the aging and ill Empress deposed. The Tang dynasty (Li family) won out and was to rule for the next two hundred years and all of them were descended from the Empress. A measure of the lingering respect she held with her opponents was that she was not killed but dethroned and lived in dignity until her death six months later in 705 aged 81. At this point her ambitious and capable granddaughter Princess Anle (Li Guo’er ➚ ) who had married into the Wu family seemed a possible heir that might maintain the era of female dominance at court. She was however killed on the death of her father Zhongzong in 710. Two sons of Emperor Gaozong and Empress Wu Zetian then retook the throne (they had briefly been Emperors before she deposed them) Zhongzong 中宗 ➚ (705-710) and then Ruizong 睿宗 ➚ (710-712). It was only after Ruizong’s abdication in 712 in favor of his gifted son Xuanzong that firm control over the country was restored during his long reign 712-756. Citation information for this page : Chinasage, 'The Empress Wu Zetian [624-705]', last updated 24 Sep 2018, Web, http://www.chinasage.info/wuzetian.htm.